Rita R. Shane, Pharm.D., FASHP, FCSHP "We should always remember that progress is the outcome of each interaction that we have. Each encounter presents us with an opportunity and a responsibility for demonstrating our value to each stakeholder, especially to our patients. ‚ An indicator of progress in transforming pharmacy will be...when patients ask, "Where is my pharmacist? ""
Thank you for the privilege of being here tonight to follow in the footsteps of the exceptionally talented and dedicated pharmacy leaders who preceded me. ASHP has provided me with numerous opportunities to learn, to collaborate, to develop lifelong friendships, to grow professionally throughout my career, and, most importantly, to advance the care of patients. I feel incredibly honored to receive this recognition. To my family, staff, residents, friends, and colleagues: You have inspired me and nurtured my love for this profession. I must admit that I fell for pharmacy before I fell for my husband. My residents this year created a slogan that states “Must Love Pharmacy,” since it is a key criterion we use in selecting pharmacy staff members. As I started my journey through the collection of Harvey A. K. Whitney Award lectures, Paul Abramowitz reminded me that after the Pharmacy Practice Model Summit in November 2010, I had remarked that the time had come for an Institute of Medicine (IOM) report to examine our current and future roles and to indelibly imprint pharmacists as an essential component of health care delivery models. I am optimistic that, at some point, we will have the opportunity to become the subject of or substantially contribute to an IOM report that addresses the essential role of pharmacists in optimizing medication use. In the interim, I will use the IOM process as a framework in which to provide my remarks, which I will call the Institute of Pharmacy report. By way of background, IOM is a nonprofit organization and the health arm of the National Academy of Sciences. IOM convenes groups to address important health care issues using evidence-based and expert-based methodologies. Studies are based on specific directives from Congress or requested by federal agencies or other organizations. At the turn of this century, IOM released a breakthrough report, To Err is Human: Building a Safer Health System, which created the impetus for the quality and safety initiatives that we have seen promulgated over this past decade. Some of you may recall that many years ago a keynote speaker at an ASHP national meeting was Faith Popcorn, the founder of a market research consulting company, who coined the term trendbending, defined as the process of shaping strategy or products around current trends. Since I am an avid follower of health care trends, my objective is to apply trendbending to examine the implications of key imperatives for pharmacy. The evidence-based and experience-based methodologies that I have used include an analysis of published literature, expert opinion from key stakeholders outside of pharmacy, and key principles and perspectives garnered from the Whitney lecture collection, which, according to Jim McAllister, represents a timeless legacy for us all. I have chosen health care trend exemplars, borrowing from recent IOM methodology, based on their relevance to our mission to ensure the best use of medications. These trends are also significantly aligned with the Pharmacy Practice Model Initiative. As we explore the evidence, the numerous opportunities for pharmacy engagement provide us with a blueprint for providing our imprint as individual pharmacists, as members of our health systems, and as a profession. Let’s begin trendbending. In order to reduce rising health care expenditures, the Center for Medicare and Medicaid Services (CMS) value-based purchasing program and commercial payer plans are tying health-system reimbursement to performance in the areas of quality, patient satisfaction, and avoidance of preventable events (i.e., hospital-acquired conditions and readmissions). Commercial health plans are also experimenting with bundled or global payments for hospitals and physicians based on episodes of care. As an example, Blue Cross Blue Shield of Massachusetts has implemented global payment contracts in Boston that provide incentives to reduce readmissions and improve patient satisfaction. Mebel and colleagues recently described the implications and opportunities for pharmacy based on the growing number of medication-related quality measures and opportunities to improve HCAHPS (Hospital Consumer Assessment of Healthcare Providers and Systems) patient-satisfaction scores specific to pain management, understanding of medications prescribed, and information provided after hospital discharge. Are we able to demonstrate our contributions to improving organizational performance on medication-related indicators and patient satisfaction? How are we positioning our departments and our profession to address global reimbursement for episodes of care? The use of team-based care to reduce health care costs is a key provision of the Patient Protection and Affordable Care Act and has resulted in the emergence of initiatives focusing on three factors. First is transitions of care. Innovative programs such as BOOST (Better Outcomes for Older Adults Through Safe Transitions) and Project RED (Reengineered Discharge)[7,8] have integrated pharmacists into their multidisciplinary teams. Second is reducing hospital admissions and complications. The Partnership for Patients is a national program designed to reduce hospital readmissions by 20% and hospital-acquired conditions by 40%. These goals were based on data demonstrating that about one in five Medicare patients is readmitted within 30 days and one in seven patients is harmed during his or her care. Third is the model of comprehensive primary care and the medical home. The CMS Innovation Center specifically recommends robust team-based care, which includes pharmacists in primary care practices to coordinate care and prevent emergency room visits. The Health Resources and Services Administration established the Patient Safety and Clinical Pharmacy Services Collaborative in which pharmacists play a key role in community-based teams focusing on high-risk, high-cost, underserved patient populations, with the goal of reaching 3000 communities by 2015. Over the past three years, these teams have achieved significant improvements in patient safety and outcomes. Recently, the U.S. Surgeon General Report on “Improving Patient and Health System Outcomes Through Advanced Pharmacy Practice” provided an extensive review of pharmacists’ contributions on health care teams in a variety of settings. A prerequisite for providing team-based care is ensuring that the health professions’ work force possesses interdisciplinary skills: specifically, the knowledge of each team member’s role and responsibilities and the ability to relate to each other to ensure patient care needs are met. IOM recommended the restructuring of health professional education to enable students to develop team skills as the foundation for working together effectively as graduates. [15,16] To meet this work force imperative, the Interprofessional Education Collaborative was established by health care professional organizations to integrate education among physicians, pharmacists, nurses, and other health care professionals on health sciences campuses. Interprofessional training to promote collaborative care is already occurring at a number of sites, including the Northeast Ohio Medical University (NEOMED) College of Pharmacy, Medical University of South Carolina, University of California San Diego, and University of Kentucky. NEOMED has an interdisciplinary curriculum in which a significant proportion of pharmacy learning is accomplished simultaneously with medical students to prepare graduates for a team approach to patient care. Have we placed sufficient emphasis on transitions of care and the medical home in redesigning our practice models? Is it time to collaborate with physicians, nurses, and other health care providers in our health systems to create team training programs across our respective disciplines for students, residents, and staff? The nursing profession has positioned itself to play a key role in health care reform through advanced practice roles, through research demonstrating improved patient outcomes associated with nursing actions, and by providing a plan for transforming the future of nursing, detailed in a recent IOM report. The strategic agenda for the nursing profession includes providing primary care in response to physician shortages in these settings. Almost 20 years ago, the American Nurses Association Safety and Quality Initiative established an infrastructure for measuring the impact of nurses on patient care. The initiative resulted in a national database of evidence-based nursing-sensitive quality indicators, including nursing hours per patient day, number of falls, and rate of nosocomial infections. A number of these indicators have been adopted by national quality organizations, such as the National Quality Forum, and are supported by regulatory agencies. From a public perspective, nurses have maintained the top rating in the Gallup poll each year since 1999, with the exception of one year. How do we partner with the nursing profession to further define our respective roles in medication management? How can we learn from the important work nurses have done in developing nursing-sensitive indicators? Avoiding chronic illness is the primary goal of prevention programs such as the U.S. Department of Health and Human Services’ Healthy People 2020, which includes a number of specific medication-related objectives. The IOM report recommended a “living-well framework” that specifies “tailored pharmaceutical treatment” as an intervention strategy for patients with chronic diseases. We know that employers and payers have developed prevention programs to reduce health care costs. However, are you aware that CMS supports an annual wellness visit under Medicare Part B that includes a review of prescriptions? Given this promising support of our role in chronic diseases, do we as health-system pharmacists place sufficient emphasis on chronic medications during the time that patients are in our hospitals? Do we consistently evaluate chronic medications in the context of what patients will need when they leave our premises? Do we follow up with these patients after discharge and in our outpatient clinics? Shouldn’t all patients have at least an annual review of their medication list by a pharmacist as a prevention strategy? And wouldn’t high-risk patients benefit from a more-frequent, perhaps quarterly, medication review or “therapeutic tune-up”? Can we demonstrate reduced costs and better patient outcomes, which would support the inclusion of this function as a national quality indicator? An added layer of complexity in the treatment of chronic debilitating diseases has been the emergence of biologicals and other therapeutic advances. These agents, generally referred to as specialty pharmaceuticals, can cost up to $350,000 per year and are expected to represent 40% of health plan spending by 2020. The cost, quality, and safety issues related to chronic diseases are magnified with the use of biologicals. The impending introduction of biosimilars will add new challenges and responsibilities related to formulary evaluation, patient selection and education, monitoring, the evaluation of adverse events and outcomes, and ethical considerations compared with innovator products. Some health systems have been “insourcing” specialty pharmacy management to reduce fragmentation of care and support contracting and revenue cycle management. The projected growth in the number of chronic diseases that will be treated by specialty pharmaceuticals and the associated quality, safety, and cost considerations will require pharmacists who possess the clinical, operational, and financial skills to support patient needs. Low health literacy affects 9 out of 10 adults, results in a higher incidence of chronic diseases, and leads to poor health outcomes. Health literacy is defined as “the degree to which individuals have the capacity to … understand basic health information and services needed to make appropriate health decisions.” The magnitude of this problem has resulted in a national action plan to improve health literacy by advancing research and evidence-based interventions. Recognizing that low literacy increases the likelihood of medication errors, the Agency for Healthcare Research and Quality recently established a pharmacy health literacy center to support the development of knowledge and skills in this important area. “Universal precautions” to minimize the risk that patients will not understand information about their health or treatment—analogous to minimizing the risk of spreading infections—and the “teach back” method are important elements of the health literacy tool kit. I would venture to guess that the majority of practicing pharmacists are not fluent in these methods of communication with patients. Since medications are often the mainstay for treating chronic diseases, poor adherence adversely affects patient outcomes and increases hospitalizations at a cost of $100 billion per year. The complexity of medication regimens, level of health literacy, cultural beliefs, and economics are among the barriers to adherence. Evidence supports case management, patient education, simplification of medication regimens, and pharmacist follow-up as effective interventions for improving adherence. An important aspect of new care delivery models will be the application of these interventions to improve adherence and reduce health care costs. Isn’t it imperative that we integrate competencies related to medication literacy into education of pharmacy students, residents, and our staff? Have we identified improving patient adherence as a core responsibility of health-system pharmacists? Development of a framework to support regulation by the Food and Drug Administration if progress in safety is not achieved. Pharmacists have recognized the challenges associated with health IT for over a decade. In 1999, Michael Cohen and the Institute for Safe Medication Practices created medication-safety field tests for pharmacy information systems. ASHP established an essential learning platform through the Section on Pharmacy Informatics and Technology, thanks to early work led by Toby Clark and others. More recently, Mark Siska and Dennis Tribble provided us with an excellent road map for ensuring the safe and effective use of technology. As a profession, we have accepted the challenges associated with understanding, integrating, and implementing complex health IT. We have come to recognize that unless we understand the workflows and human interfaces associated with technology, including the transfer of information across the continuum of care, we cannot keep our patients safe. We frequently find ourselves with new work that is transaction based rather than patient centered, undermining our role as guardians of safe medication use and relegating us to servants, as Paul Pierpaoli so eloquently stated. The complexity of medication workflows associated with health IT and the resulting effects on medication safety and quality are not well understood by most health-system decision-makers, health IT vendors, or our patients. Have we ensured that pharmacists play a key role in IT decision-making in our health systems? Perhaps the recent IOM report lays an imperative at our doorstep. Is it time for pharmacy to lead a multidisciplinary effort to ensure that safe, effective, efficient medication management is a top priority of health IT vendors? I have chosen to use cancer as a case study since it encompasses the trends that I have summarized thus far and some important trends that bear consideration. Cancer is a high-cost, chronic disease, and advances in targeted chemotherapy can be expected to increase costs significantly. Multidisciplinary teams including pharmacist specialists already play a key role in managing complicated chemotherapy orders, supportive care, and increasingly complex medication regimens. Emerging payment models, such as episode payment for entire treatment courses for breast, lung, and colon cancer, are being pilot tested. These models are evaluating the impact of standardized treatment regimens on patient outcomes (e.g., emergency department visits, complications, adverse events, survival). Health systems are acquiring oncology practices in response to reduced margins for chemotherapy in the private sector and to advance an integrated approach to patient care. Oncology medical homes will be important to support patients and meet clinical, quality, and economic goals. Advances in cellular immunotherapy will result in new approaches to treatment and create ethical challenges due to their high cost. Oral chemotherapy agents are transforming the treatment of many cancers. Patients require close follow-up to manage adverse effects, ensure adherence, and prevent drug interactions. These costly medications are often provided by specialty pharmacies. Biosimilars will require careful monitoring of efficacy and safety in comparison to the innovator products. Patient education regarding these agents will also be important. Lack of health literacy is a major challenge for cancer patients and a barrier to effective treatment. Ensuring the safety of chemotherapy management with health IT systems is essential. Pain management, palliative care, and end-of-life management are nationally recognized patient care and economic priorities. Health-system pharmacy must answer the following questions: Although board-certified oncology specialists are already engaged in providing the services described, are we training a sufficient cadre of pharmacists to meet the many dimensions of cancer care? Are we training leaders who understand and can manage the full scope of oncology services that are needed? Since cancer is a chronic disease, should this be a priority focus area for education and training, just as hypertension and diabetes are, to ensure that pharmacists across the continuum of care possess the necessary knowledge and skills? C. Duane Dauner, CEO of California Hospital Association. We should prioritize high-risk, high-cost populations who would derive the most benefit from pharmacists’ knowledge and skills. Technology should support prioritization of these patients. Pharmacists have a tendency to focus on medications being prescribed rather than whether the regimens are effective based on patients’ clinical needs. Medication overuse, specifically discontinuing medications that patients do not need, is an area that warrants more emphasis. Health-system pharmacists should play a greater role in patient education and improving adherence. “Teamness” is essential to leverage the contributions of each team member for the benefit of the patient rather than to differentiate the value of one team member over another (Bagley B, personal communication, 2012 Feb 28). Significant improvement is needed in handoffs between health-system pharmacists and the patient’s next level of care, whether it be home, a skilled-nursing facility, or assisted living. Communication with patients and caregivers after hospital discharge is important to reduce errors and readmissions. The interface between health-system and community pharmacists is critical in order to ensure one source of truth for the patient’s medication list. Relevance is an important aspect of how we relate to and are perceived by our organizations and by health care professions. Publishing studies in key health care journals is important to increase awareness of pharmacists’ contributions outside of the profession. Individuals who pursue the pharmacy profession do not always seek or want to interact with patients. Not all pharmacists have the same level of expertise. As one would expect, the perspective of each stakeholder was based on his or her personal experience interacting with pharmacists, which demonstrates, as Bruce Vinson has stated, that knowledge of the value of pharmacy services is largely local (Vinson B, personal communication, 2012 Mar 23). Visibility of pharmacists in patient care areas is essential. Each interaction that pharmacists have with patients, members of the health care team, and decision-makers is an opportunity to demonstrate relevance and value, the theme of Roger Anderson’s Whitney address. We need to show through our actions that our goals are in alignment with current health care priorities at each opportunity and level of engagement: with the health care team, patients, executive decision-makers, the health care professional community, and, ultimately, policymakers. 1977, Herbert S. Carlin: “Patients must be the central focus of all our endeavors. 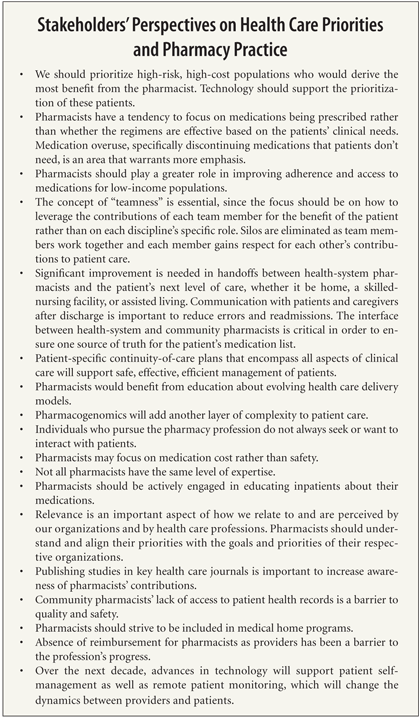 To succeed as professionals, pharmacists must be mature and realistic enough to accept a patient-centered interdisciplinary approach” to patient care. The evidence and expert opinions provide the foundation for my call to action. Patient-centered health-system pharmacy practice. Current health care financing models and regulatory requirements have created a health-system pharmacy model that focuses significant resources on acutely managing medication orders related to the patient’s admission rather than ensuring that the patient’s medication list is optimized to prevent drug-related problems and readmissions. Think about the significant pharmacy resources we invest in changing long-term medications to those on our formularies, which then creates confusion at discharge. Isn’t the need for medication reconciliation an unintended consequence of acute care “medication micromanagement”? Think of each admission as an opportunity to conduct a point-of-care evaluation, much like measuring blood glucose or the International Normalized Ratio to determine if drug therapy changes are needed. Our objectives should be to resolve drug-related problems associated with the patient’s admission, evaluate the patient’s chronic medication needs, and prepare the patient to safely use medications after discharge. Here is my vision for what a reengineered patient-centered medication management model might look like. I recognize that this is a significant departure from current practice; however, my objective is to stimulate us to think beyond the traditional medication-use process and focus on what our patients need. Upon admission, acute and long-term medications are prescribed. Pharmacists, who have demonstrated competency in therapeutic management, participate in ordering medications as part of the collaborative practice team. Pharmacists evaluate medication orders to ensure safety and quality in the context of the whole patient. Medications are dispensed to treat acute patient care needs. Patients or family members bring in home medications for identification and evaluation by pharmacists. When patients are admitted emergently, initial doses of long-term medications are provided by the pharmacy until those medications can be brought in from home. If this is not possible, subsequent doses are provided by the pharmacy. Throughout the hospitalization, pharmacists evaluate the medication regimen in collaboration with the team and recommend additions of, changes to, and discontinuation of medications based on the patient’s clinical needs during hospitalization and in anticipation of long-term medication needs after discharge. Patients are interviewed by the pharmacist to determine if they understand how to take their medications. Education is provided using the “teach-back” method to determine medication literacy. Patients who are competent are allowed to self-administer medications under the supervision of the nurse. Patients document their medications on a patient-centered medication administration record, which they can continue to use after discharge. Pharmacists develop longitudinal patient-specific pharmacotherapy plans, as Paul Abramowitz recommended, in collaboration with the team. High-risk patients, defined as those who are on complex medication regimens, have diseases or conditions that put them at risk for readmission, or have poor medication literacy, receive a follow-up call within 72 hours after discharge to reassess medication literacy and adherence. Additional follow-up encounters, via phone or video conferencing, are scheduled based on the pharmacist’s assessment of the patient’s risk for adverse medication outcomes. Obviously, there are multiple considerations and consequences associated with this model, not to mention a host of regulatory issues. The evolution of these ideas requires much more dialogue with stakeholders. However, the questions I ask are these: Would this approach enable pharmacists to spend more time focusing on patient-centered medication needs and less time managing medication order transactions? Would these changes have a positive impact on team members by providing them with more time for patient care activities? Would patient care be improved by this reengineered model? As a profession, we need to make improving patient satisfaction a priority. Pharmacists should be integral to and active participants on every health care team. The pharmacist should be the member of the team who is responsible for ensuring patient medication literacy and adherence. Evaluation and simplification of long-term medication regimens in anticipation of discharge should be a priority focus area, especially for high-risk patients. Pharmacists across all settings–acute care, medical home, and ambulatory care–should serve as medication case managers to coordinate longitudinal medication management for high-risk patients, as described in the reengineered model. At a minimum, all patients should have an annual review of their medication lists by a pharmacist. We should lead a health professional collaborative focused on the integration and usability of health IT systems to ensure medication safety and invite IT vendors to participate. We should create an innovation center within the profession to stimulate practice advancement based on current health care imperatives. The center could engage multicenter teams to incubate and spread best practices. Metrics and research opportunities. In his 2009 Whitney address, Paul Abramowitz stated that “to ensure that we have the resources to provide the pharmacy care that our patients deserve, it is critical that we also develop the appropriate metrics and measurement tools.” Multicenter studies should be conducted to identify and validate a core set of pharmacy-sensitive indicators associated with improved patient outcomes. We should engage colleges of pharmacy and residency programs to support this research. Number of adverse drug events in high-risk patients (i.e., oncology, critical care, and pediatrics) per number of pharmacist hours per 100 beds as the initial phase in determination of pharmacy-sensitive indicators. Adherence rates (defined as medications taken as prescribed) and readmissions rates 30, 90, and 180 days after discharge in high-risk patients with pharmacist follow-up, compared with adherence rates without pharmacist follow-up after discharge. Measure what we do in terms that are relevant to decision-makers at the health-system, health professional, and health policy levels. My career and this extraordinary recognition would not be possible if not for the special people in my life: my mother, whose love, wisdom, and inspiration have guided me; my husband, Jeff, who has listened (patiently) as I’ve talked about pharmacy for over 30 years and whose love, respect, and support have enabled me to have this amazing career; my children, Elizabeth and Benjamin, who represent my most important accomplishments and who now teach me about what is important in life; and my management team and staff, who put up with my passion and obsession–your support and dedication have been invaluable to me. Thank you especially to Melsen Kwong and Frank Saya, who have been with me since I became director; and to the leaders and medical, nursing, and clinical staff of Cedars-Sinai Medical Center, who have enabled me to grow since I was a pharmacy student and who continue to support me every day. Lastly, I would like to thank all of my extraordinary friends in pharmacy who have nurtured and inspired me; I wish I could recognize each of you. There are a few exceptional people I want to mention who have served as my compass for many years: Bill Gouveia, Bill Zellmer, Bruce Vinson, and Paul Abramowitz. Thank you to all of you. © 2012, American Society of Health-System Pharmacists, Inc. All rights reserved.